My parents had been looking for some interesting garden stones to install in a new garden they started late last summer and worked on through the fall. You might remember seeing pictures of their gorgeous yard in this post that showed the expanded porch and pergola areas that we helped to design and build a few years back. (Seriously, look at that post – and look past the old formatting – to the finished pictures, they are amazing.) They looked for stones in STL when they visited us, but didn’t find just the right thing. They checked in Louisville, we checked in Atlanta, but nothing really caught our eye. My mom had thought that four stones would be nice, and since she has four grandchildren, she thought it would be cool if they had some sort of design that reminded her of them. She might have even hinted that I could tackle some on my own, but I quickly shot that idea down. Mosaic work takes some serious talent and know-how, and so I started looking around for a mosaic artist that might be able to translate our rough ideas into reality. By this time it was Thanksgiving, and Christmas was fast approaching. 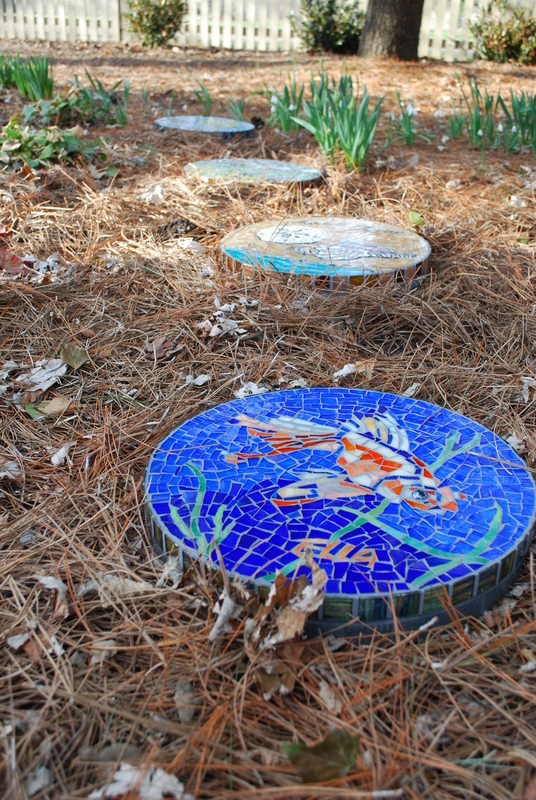 I found the artist that I wanted to work with – Carol Lancour of Mid Century Mosaics – but I was quite sure that we were out of time for a Christmas delivery. I was hoping to at least get the process started though, even if it meant we just wrapped up a giant IOU for Christmas morning. Here’s what we’re thinking. My parents have a beautiful yard and garden areas – it backs up to a farm, so it’s really quite lovely. They’ve recently cleared out and planted a new garden area in the rear, and my mom has been trying to find some stepping stones for the area that are attractive, with no luck. That’s where this idea started. We would like four of them, and my parents have four grandchildren – E (11), AP (9), C (6), and F (5). We love the idea of doing one stone for each grandchild, but we didn’t really want to pick designs that necessarily reflect their interests now – we’d get a lot of peace signs and soccer balls! These stones are going to be so beautiful, and I’d like them to look a little more timeless, and also reflect my parents loves as well, so I think I have some good ideas. 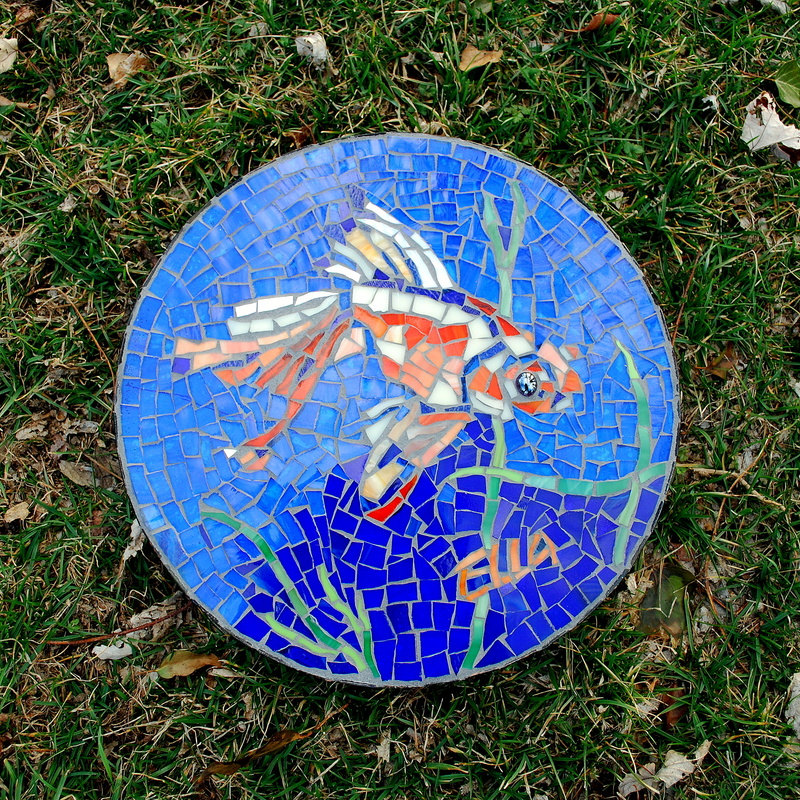 I was really drawn to the tile you did with the fish. It reminds me of the koi at the Botanical Gardens here in St. Louis. My parents love visiting there – it’s one of their favorite places. They also love traveling, so for me it feels like a nice representation of that. My parents also have a lovely pond in their backyard, and I have a photo of E when she was just a toddler, feeding the fish with my dad, that I love. E loves aqua too, all blues, really, so it seems perfect for her. My parents love the beach – we all do, but especially my sister and her kids. I thought some seashells on the sand, maybe at the edge of the surf. We have vacationed together for decades at Sanibel Island, Florida. 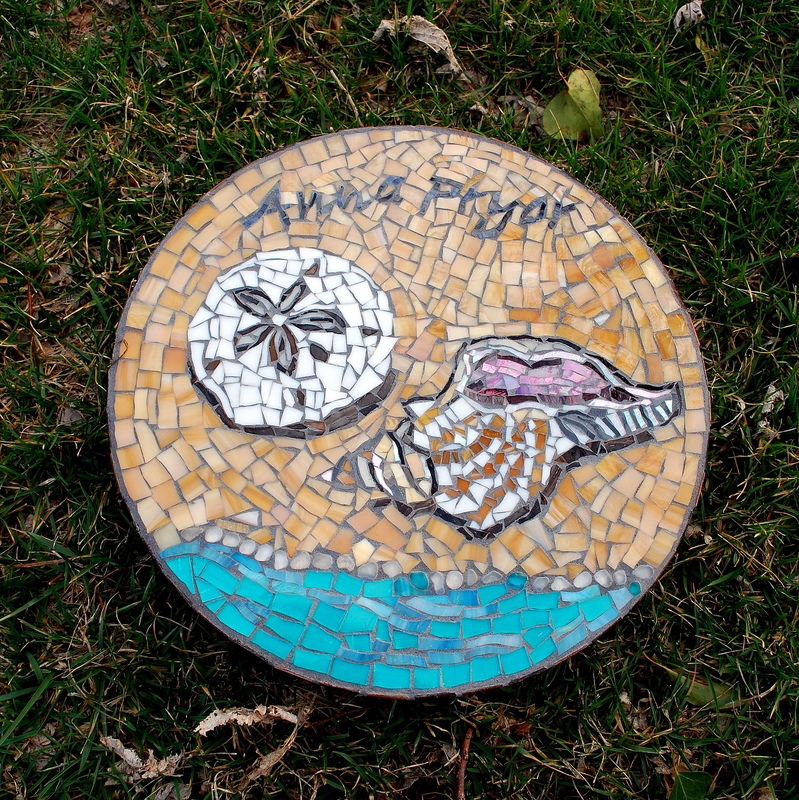 It’s one of the best shelling beaches in the world, and I’m attaching three shell photos of the type of shells we’ve collected over the years. We see lots of sand dollars too, and my mom loves those. My parents live in central KY, just off main street in a small town outside of Lexington. The front of their house looks over the historic downtown, and the back of their house backs up to a tobacco farm. My nephew LOVES tractors. I thought a sunset view of a farm with a signature black barn in the distance, and a tractor in the distance, might be a great symbol of home for this stone. In the next email, I’m attaching a photo of the farm behind my parents house, their porch (the fence line is cleared out a lot more now, and you can see more of the farm behind), and also a photo of a tractor, and a photo of the color of tobacco fields just before harvesting. And the baby of the family – my F! F loves the outdoors, loves exploring gardens, and really, really loves ladybugs. 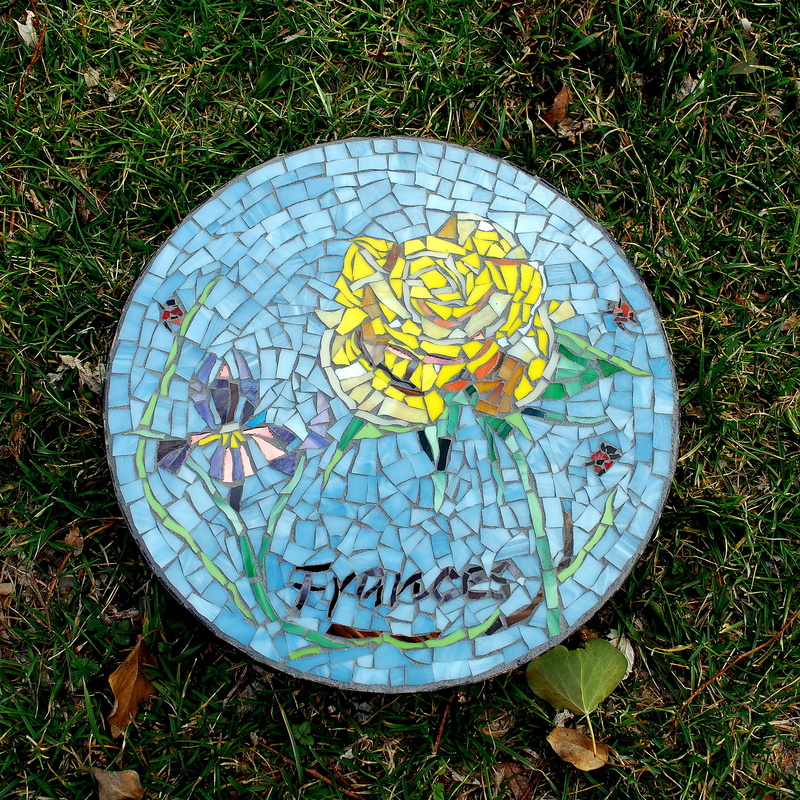 I thought we might have a stone with flowers – my mother really loves all flowers, but she especially loves yellow roses and purple iris because those were her mother’s favorites. And maybe we could incorporate some little ladybugs there, just as a small reference to F.
I also thought the four stones sort of relate to the seasons too, and my parents love living in KY because there are four distinct seasons. Flowers (Spring), Beach (Summer), Farm (Fall) and maybe the fish, with the blues, and silvers, could look sort of like Winter? I’d love to incorporate the kids’ names onto the stones but they don’t need to be huge, whatever you think for legibility. I trust your judgement. When I pulled up the record of our Etsy conversations to copy the portion above, I discovered that we sent a total of 101 messages to one another over the course of two and a half months. Working with Carol does not require that sort of daily conversation, I’m just pointing it out to show you how tolerant she is of chatty people like me. I told her early on that I’d give her a general direction, but that I trusted her to run with that. She did an incredible job. I’m sharing this idea with you in case you are looking for a special gift idea for Mother’s Day or if you’re really on the ball and planning ahead for the holidays later this year. Sometimes parents can be tricky to find gifts for – they still like to spoil us and the grandkids, and they always tell us they have everything they need. This was a neat way to add some color and creativity to their garden while celebrating those things they love so much (including those grandkids!) 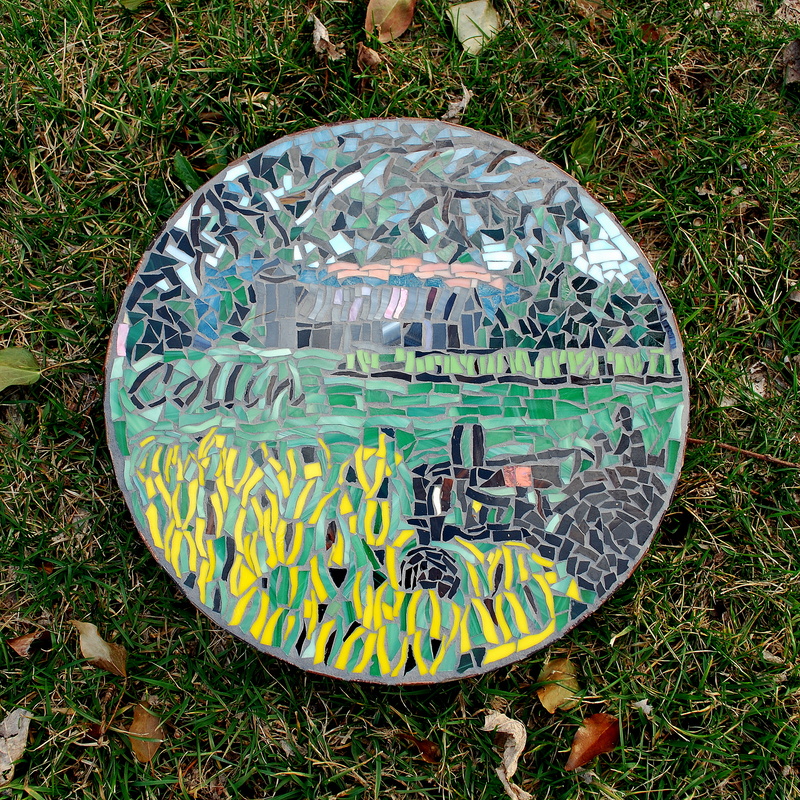 If you are lucky enough to work with Carol on a project, please tell her I said ‘Hi’ – I’ll miss talking to her now that this project is complete, although I’m trying to convince her to make a trip to the Midwest to see the fabulous mosaics at The City Museum! This entry was posted in general and tagged gifts. Bookmark the permalink. City Garden and the new Cathedral, what more could a mosaic artist need to see? The stones are beautiful!